So my sis is in the process of adopting a baby from Ethiopia. The Mr and I are excited to be able to go with her to pick up her baby (whenever all the paperwork goes through and we finally get "the word" that we get to "travel"). I don't know about you all, but I don't know that much about Ethiopia. I mean, of course I know that it is a poor third world country (where we were told people were starving when we didn't eat our dinner)... and that it is in Africa. That about covers it. I've been doing some research - and am sharing some basic facts here with you. 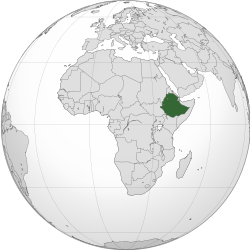 Ethiopia is in northeast Africa, landlocked, and is bordered by Djibouti and Somalia to the east, Kenya to the south, Eritrea to the north and Sudan to the west. The gross domestic product per capita in 2008 was $328 - contrast that with the GDP per capita of the USA at $46,716. Wow. That is poverty on a level I have never personally seen. I've been to China, Thailand and Indonesia - all are much less prosperous that the US, but nothing like Ethiopia. Should be a real experience. Though my mom always told me people were starving in Ethiopia, it turns out that they have some interesting cuisine. Alecha: Stew, either chicken or beef, but not hot and spicy stew. Berbere: Thick, red paste composed of paprika, salt, ginger, onion, garlic, ginger, cloves, cinnamon, nutmeg, cardamom, allspice, pepper, coriander, and fenugreek blended by water and oil. Fenugreek: Little brown seeds that are ground into tan powder for spice seasoning. 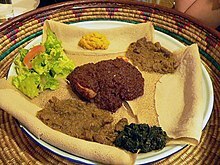 Injera: Thin, spongy pancake-like flatbread made from teff flour used to scoop up and wrap food in place of utensils. Niter Kebbeh: Spicy butter made from sautéeing onion, garlic, ginger, cinnamon, turmeric, cardamom, clove, and nutmeg in butter. Shiro Wat: Vegetable stew popular during religious fastings. Sik Sik Wat: Beef stew. Teff: Ancient grain of Ethiopia available in whole-grain form as well as ground (teff flour) in health food stores. Wat: Essentially means stew—typically made from base of berbere paste so it is hot and dense with spices. We're really looking forward to going (and not just because we're going to have a new little niece to spoil)! As I learn more about this interesting country, I'll pass it along. I like it! Very interesting reading. I'm excited to see it in person. Going to check out the local Ethiopian restaurant next week. Hope I like the food!